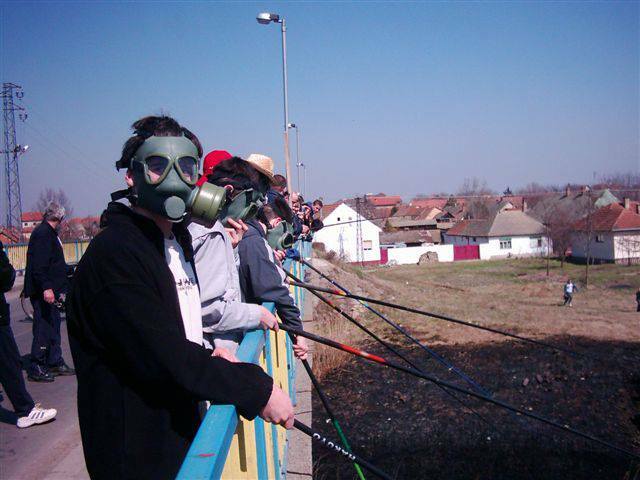 Clean the Veliki Backi kanal! - Protests at the Kula bridge on the Veliki Backi kanal. Veliki backi kanal continues being an environmental black spot in Serbia given that the waste water treatment plant still has not started operating. The channel Veliki Backi kanal is located in the northern part of Serbia and it is part of the channel system Danube-Tisa-Danube (DTD). DTD was constructed in the second half of the 18th century for transportation of goods, flood protection and irrigation. The problems with industrial pollution of the DTD started in the 20th when numerous mainly food producing factory started discharging their untreated waste waters. Additionally, the channel is a collector for untreated waste waters from nearby municipalities Crvenka, Kula and Vrbas. Due to the accumulation of toxic sediment, over the years, the channel depth decreased from approximately 3 meters to only 30 centimeters at certain locations. In 2004, the Norwegian Institute for Water Research identify the channel Veliki Backi kanal as the most polluted water body in Europe and one of the environmental hot spots in Serbia. The most polluted part of the channel passes through the town of Vrbas, where 400,000m3 of polluted sediment have been found, including presence of heavy metals, poly-aromatic carbohydrates, and coliform bacteria. The NGO 'Ekoloski pokret Vrbasa' from town of Vrbas organized multiple street protest and petitions, submitted lawsuits against the polluters, and appealed to the Serbian Government. Many of the juridical cases against the companies’ have been rejected due to the lack of evidence. 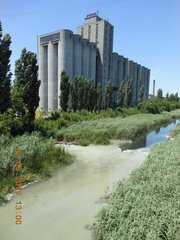 According to the NGO, the factories used to discharge clean water to dilute the channel pollution just before the measurements. In 2008 an old proposal on solving the pollution of the channel was accepted. The project included construction of a central waste water treatment plant (CWWTP), expansion of the municipal sewage and inclusion of municipal waste waters and industrial waste waters on the new system, and finally, removal of the polluted sediments and revival of the channel Veliki Backi kanal. After the change of the government in 2012 the project was delayed. Its finalization was announced for the end of 2014. However, the construction of the CWWTP is still ongoing. According to the original plans from 2007, the CWWTP was design to receive water from 120,000 PE (population equivalent), however over the years this number has decrease importantly to only 40,000 PE that is not enough water to enable normal functioning of the plant. In addition, only water treatment line was competed in 2015, while mud treatment line was to be built in first half of 2016. The plant could start with a trial operation to respect the deadlines, otherwise the municipalities will have to pay back the money. However, putting in operation unfinished plant would cause the discharge of semi-cleaned water that was criticized by the local people who called for accountability of EU as main investor. Remediation of the polluted section of the DTD channel started in August 2014 when 3 km of the channel was cleaned (Vrbas-Bezdan close to Kula). According of the authorities 50,000 m3 of mud was removed and disposed in the safety measure. The work on the sewage system expansion, including several kilometers of tubes that would connect it to the CWWTP, and removal and safe disposal of the toxic sediments is still to be completed. Project Details Length of the DTD channel 112km. Veliki Backi kanal passes by town Vrbas in length of 6km and contains 400,000m3 of polluted sediment containing chrome, copper, nickel, poly-aromatic carbohydrates. CWWTP total capacity of load for 120,000 population equivalent. Investment in the CWWTP is the largest EU investment in Serbia. Sanitary sewerage collection system, that includes: 83,2 km of collection network, 30 km of transmission main and 22 small pumping stations. The cost of cleaning of 3 km of DTD Vrbas-Bezdan is USD 100,000. Other According to the studies elaborated by doctors of Vrbas hospital there is increase of occurrence of different types of cancer and respiratory diseases in the population neighboring the channel. Development of Alternatives The NGO demands finalization of the construction of CWWTP and sewage systems, remediation of the Veliki Backi kanal, as well as to penalize the polluting industries and oblige them to treat the waste waters. Why? Explain briefly. The construction of the CWWTP was delayed due to the change of government in 2012 and most currently due to difference in the planned and real amount of waste water flow to be treated in the plant. This makes uncertain the plant opening. Many law suits against the polluting companies stay unresolved due to lack of evidence or bad regulations, while the factories continue discharging the waste waters in the channel. So far, only small part of the channel was cleaned of toxic sediment. Vrbas/Kula: Prečistač ili Skadar na Bojani? Veliki Backi kanal – Veciti problem?